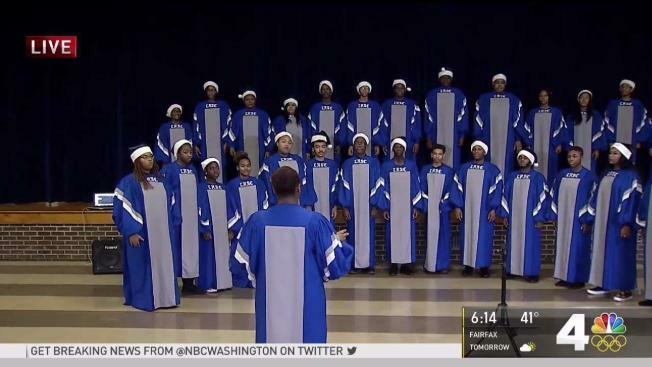 A Maryland high school choir got an early Christmas present when their album made it to one of the top spots on the Billboard music charts. The Largo High School Choir's album, "Rejoice! : A Celebration of Music," climbed onto the charts, reaching the 21st spot on the Billboard gospel charts Monday. The 15-track mix of gospel and Christmas classics features favorites like "The First Noel", "Jingle Bell Rock" and "Go Tell It On The Mountain." The choir also graced the stage of one of the country's most famous venues. The Largo High School Choir performed on the Kennedy Center's Millennium Stage on Sunday. The choir performed “Rejoice” with other performing arts students through dance, narration and instrumental music. In April, the Largo High School Performing Arts Department was recognized by the D.C. chapter of the GRAMMY Recording Academy and was awarded a $2,000 grant. Last year, the school was selected as a GRAMMY Signature School Enterprise semifinalist. The choir has performed at other events and venues including the Howard Theatre, the Washington National Cathedral and the National Christmas Tree Lighting.